The vision for South Los Angeles is to build beautiful, safe, and thriving neighborhoods that provide existing residents with quality housing, good jobs, vibrant economic corridors, accessible transportation systems, and a place where residents can reach their highest potential. 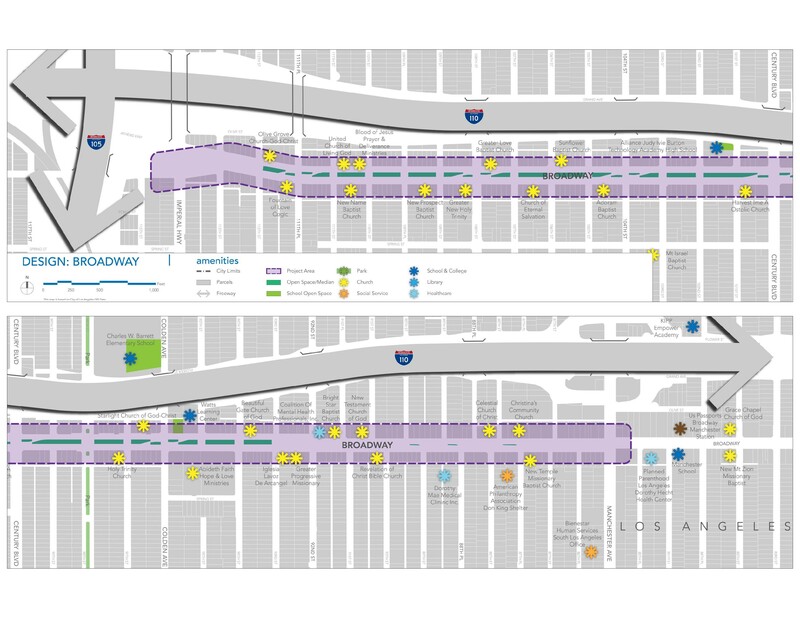 Broadway is a major neighborhood corridor in South Los Angeles with a rich history as a vibrant and bustling community shopping boulevard. Presently, Broadway is a disinvested street with high rates of traffic deaths and serious injuries. Broadway is home to schools, community services, and senior homes. Residents deserve to have a beautiful street that allows them to navigate safely. Decades of disinvestment may have dimmed its vibrancy, however we know that its future is bright. Councilmember Marqueece Harris-Dawson is launching a community-based streetscape design effort for Broadway, to increase public investment and create a safer and vibrant street for all residents. The project will be on Broadway from Manchester Boulevard to Imperial Highway. Broadway is a large street with potential to be transformed into an active street with safe transportation and recreational space. Over the next few months, Council District 8 will facilitate a community-driven process to create design options for Broadway. The collective design will be submitted for grant funding to leverage City funds for implementation. If you walk, drive, shop, live and/or access services along Broadway, you can contribute a unique and essential perspective to create a design that serves all residents. You are the experts and we need your input to make this a successful project! Follow @MHDCD8 (Facebook, Twitter, and Instagram) for upcoming workshops and outreach events!